I would like to thank Sean Barret for his blog post explaining lexing of C using state machines. Lexing phase is important for simplifying syntax grammar that is used for parsing and lexer can perform uniformization of code such as removing comments, replacing escape characters. Even though writing a lexer is not a rocket science doing this part properly is very important. Lexers could be processing megabytes of data and they are used by many development tools. Thus it’s crucial that they are fast. For the state machine I’ve used technique explained in Hoverbear’s blog post. A state machine is represented by its state, state machine can move between states using predefined transitions. We can use this concept when creating lexers. Lexer can start in Initial state and define transition under ; to Semicolon state. Semicolon is an accepting state. If we encounter ; while reading input we try to transit from current state (could be Initial state) to another state that transits under semicolon. If we end up in final state we produce a token, in this case a Semicolon token. 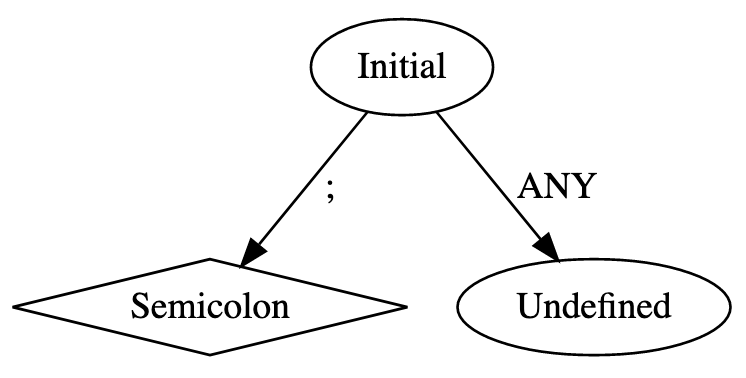 On the example below we see a state machine for recognizing semicolon a final state is represented by diamond and Undefined state is for undefined transitions. One of the implementations of this model in Rust-lang could look like the example below. We see a generic structure over S and then we define how to transit from one state to another by implementing the From trait. And then we define a wrapper that can store our state machine. A simplified version of the main parsing loop could look like this. A real world example contains a few additions to improve performance / handle edge cases. What’s character group? It turns out that many characters don’t have any special syntactic meaning and can be represented together with other characters. For example all letters with exception those characters that can be used inside hexadecimal number. Character group don’t only help us to simplify our code, but also help us to minimize size of data that has to be cached in CPU during execution. One of the biggest performance gains is preallocation. Dynamic structures in Rust allocate by default size of 0 and double their size when they need more. This allocation strategy is inefficient for token vector or unescaping characters. However, when parsing we always know the maximum size of the result. And preallocating maximum size using Vec::with_capacity or String::with_capacity drastically increased performance thanks to saving a lot of reallocations. Branch prediction plays important role when trying to squeeze out every last bit of performance. Modern CPU are very good at predicting which instruction is going to be executed next and try to save us from waiting many CPU cycles just to fetch data from cache. For example access from the first level of cache takes around 3 cycles. If our prediction success is 90% it means that app is going to be executed 30% longer than if we had 100% prediction rate. And this is penalty for accessing the fastest caches. Accessing data from SSD disk can take around 300 000 cycles of doing nothing. 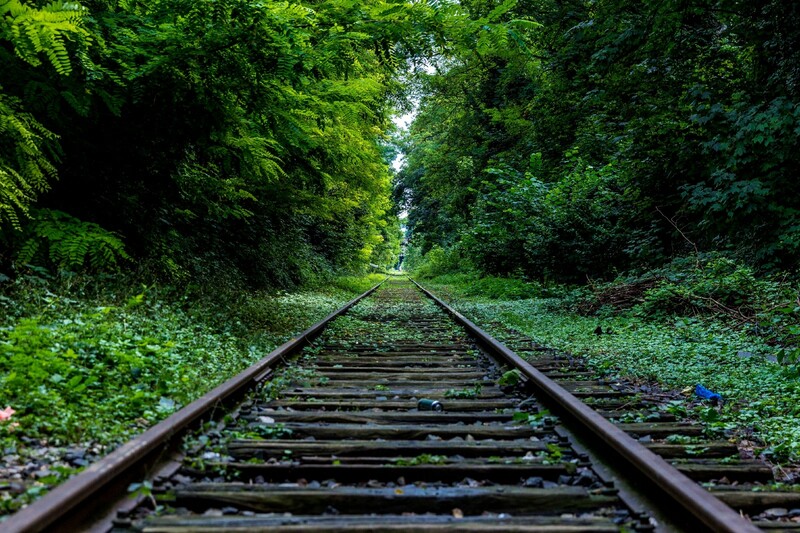 You can read more on branch prediction in my recent blog post. There are multiple ways how to minimize miss-prediction. The safest one is to avoid unpredictable if conditions (50% chance of executing) these kind of conditions can mess up prediction quite quickly. This often happens when using switch statements. CPU always predict that branch is not going to be used but eventually one of them has to be used which means that for every call to switch statement we get at least one miss-prediction. Switch statements can be usually easily replaced by perfect hash maps. Performance gain for using hash maps is not guaranteed and has to be tested on a real data. However, hash maps helped to improve prediction rate from 96% to 100% and increased speed by 10%. Performance gain could be smaller than expected, but computing hash could be costly.